Your wildest nightmares come to life. You will pray for the morning comes! -- Audio Commentary: Director and Co-Writer Jeffrey Delman delivers a pretty great solo commentary track. From the get go the man is full of trivia and tidbits that fans of the film will eat up. It's especially great when he goes into detail about the gore effects and how they were achieved. 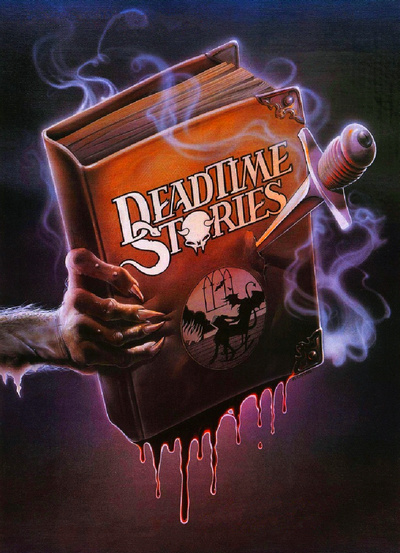 -- A Band of Gypsies: The Making of 'Deadtime Stories': (HD 15:35) Goldi Lox actress Cathryn DePrume, Mama Baer actress Melissa Leo, and actor Scott Valentine offer up some pretty terrific stories about working on the film, getting the part, and working on some of their earliest roles. -- Jeffrey Delman Interview: (HD 15:42) Delman offers up a more simplified version of what he detailed in his commentary track, but it's still a pretty terrific interview. -- Original Black Forest Short Film: (SD 29:49) This is the original version of Peter and the witches story that was later reshot for the film. This version was at one time intended to be a feature-length version or something close to it. This is from a tape master and is in fairly decent shape. It's interesting to see where this original version aimed to go with the story and it could have been made longer into a full feature, but it's plot structure as written really works better in the shortened version scene in the film. -- Red Riding Hood Alternate Opening: (SD 2:32) This is the original opening of the short before the producers wanted a more racy opening.